After reading 25 poker books and spending 2 years reading these forums [2+2] daily, finding a book that has made me say “that’s genius!” every 10 minutes, is an incredible accomplishment. Elements of Poker is an absolute MUST own for ALL poker players. It’s in a class all of its own. I’ve been dripping with excitement for this book ever since it was but a gleam in the author’s eye. It’s an awesome book filled to the brim with practical poker wisdom that has already made me a better poker player. It’s a 10. Elements of Poker is the best poker book I’ve ever read. If one poker book was going to be dropped on the doorstep of all my future opponents, this is the book I’d least like it to be. Elements of Poker. is, flat out, the best book ever written about poker. Simply said, this is the best poker book I’ve ever read – and I’ve read a lot of them. Part of me doesn’t want you to buy it or read it since if you do, you will become a better poker player and might take my money or money from a fish that I would normally get. The book is a really easy read. You can crack it open anywhere, read a bit, and get insight into the game. I feel like any person serious about poker should have a copy of this book. I especially like the parts that are in English. You know how to recognize real genius? Real genius is when someone tells you something that you have never even imagined before and you think about it for about three seconds, say “Well duh” and spend the next hour and a half thinking of the implications of the now obvious. Verneer wrote about Tommy Angelo’s “Elements of Poker” and I have to say the reciprocality stuff is sheer genius just like Darwin’s theory of descent with modification, Einstein’s theory of relativity, or Sklansky’s fundamental theorem. I am not remotely kidding. I just wanted to let you know that I have read and reread over 80 books involving poker over the years and none of them affected me quite the way yours did. Not only is it the quickest I have read a poker book from beginning to end, it is the most anxious I have been to reread a book, and soak up all the great bits of info that are either new to me or reinforce already existing ideas in my head. Your focus on so many interesting items that have never really been addressed before in a poker text and how you piece everything together makes me understand how you can charge so much for your course. I can tell that it would be more than worth it. I’ll end by saying I’ve been playing poker for a living for about the past 7 years (now in the LA area) and I’ve had a good run at it but I don’t think I’ve ever felt so motivated and properly armed to improve my game as I sit here at this moment. Thank you so much. I bought your book “Elements of Poker” a couple of weeks ago and have been enjoying reading and digesting it. I rate it as one of the best poker books that I have. Not only is the poker advice top shelf, but the book is well written and humorous to boot. I have no doubt that I am a better poker player for having read it, and I can’t wait to get back to the tables to prove it. Unfortunately, you have put me in a bit of a bind because I want to tell my poker friends about the great book I found, but on the other hand, I really don’t want them to read it. Writing like yours is truly inspirational because it is not only full of understanding, but because it is based on non-traditional ways of thinking. The latter is immensely needed in the poker literature, and I’m thankful you’ve done it. While I only return to many of my poker books as references once I first read them, I’m sure I will return to your book multiple times for complete, careful rereads. I appreciate it more than you can imagine. i’m a 21 years old german student of philosophy and education from Frankfurt and a passionate poker player. I’m writing for my german blog www.pokergeeks.de and i recently read your book “elements of poker” – i gotta admit it’s just mind-blowing. i really appreciate your work as it helped me to boost my pokergame and my winrate to unknown limits i would have never reached without your advice. i would even go as far to say it changed my life in a positive way as i try to avoid tilt in whatever appearance and do a lot of things to reach that goal. These things, such as doing sport and eating healthy, going early to bed (most of the time..) etc. really changed my quality of life. So thank you on that one. I just finished reading the book yesterday. Impressive to say the least. You changed the way I look at a lot of things about myself and about the game of poker. I still have a long way to go to reach my ultimate goals, but I feel like even if I might not have an easier time of it now, I will have a better time for sure. You’ve got a great way of looking at things, and a great way of explaining them. I can definitely see why people pay for you coaching. I could probably go over each and every Element in the book and come up with a reason for praise….But I won’t. I’ll just say I loved it all. You’ve given me a great new level of confidence. I truly thank you for the time and effort in writing it. Finally I have a legitimate reason to buy an iPad. 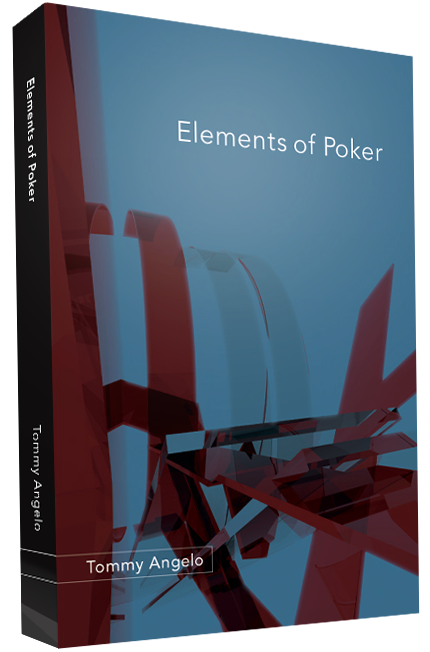 “Elements of Poker” is a breath of fresh air … Angelo has created a book that needs no deciphering. He manages to touch on subjects that no other poker books are covering and he does so in an enjoyable manner. I hope you never write a book. Tommy has written the most original poker book I have ever read. His unique content, organization, and style are hard to describe, but I’ll try. As I psychologist, I loved this sentence: “We begin to see the poker table as an environment rich in the nutrients upon which delusions feed.” Tommy’s book will help you to avoid deluding yourself. His most original chapter was “Reciprocality.” It is an extraordinarily powerful and original idea. Forgive me, but I can’t help making a pun. His position on position is utterly unique. I won’t tell you what it is, but I will say, READ IT. Better yet, buy and read the whole book. You’ll be glad you did. I just finished reading your book. This is a book I will re-read, and re-re-read, on a monthly basis. It contains everything I need. People often wonder why they don’t achieve the results that they “should” in poker. It’s like they’re missing something. Tommy is that something. While lots of great books have been written on the math side of poker, there’s never been a great book written about the human side of poker. Until now. Tommy will help you master your most difficult opponent……yourself. Elements of Poker is the book that all professional and aspiring pros should immediately purchase. None of the conventional step-by-step poker books can measure up against Elements of Poker. Here you learn the essence of the game, and you learn how to analyze the game and yourself from a higher perspective. Elements of Poker is definitely a future classic, not only in the poker literature, but in the gambling literature as a whole. How many times can you read a book before it begins to stale? It depends on the book, of course. 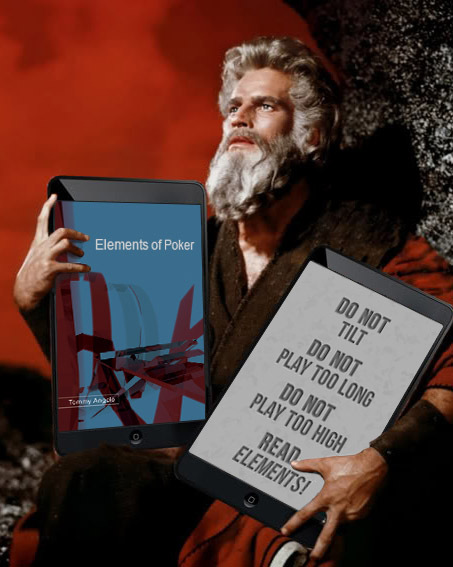 As Tommy’s lead editor, I have been over Elements of Poker more than a dozen times, and I look forward to reading it again. Tommy has crafted a book that is charming, insightful, solid and wise. I’m glad to have Elements of Poker as familiar as my skin. I just had to write and tell you how impacting your book was to me. I have read it like reading the Bible, soaking in each nugget of wisdom, and it has completely changed my game. I recommend this book to EVERY SINGLE poker friend I have, and I call it “my Zen of Poker” book. Having gone through a couple of ruts and a couple of tilts in my game, I was feeling pretty bad about my poker playing. Almost to the point of quitting because I felt like I was just not good enough, nor would I ever be good enough, to continue on in my favorite sport. I had gone to my local casino and played about two hours too long. In a $2-$5 spread no-limit game I bought in for $300, and played for about two hours having made an additional $200. I was tired and knew I should quit, but could not pry myself up from the chair for some reason. Needless to say that I went on tilt and left with nothing. As I walked out of the casino I felt terrible, and mad at myself because I knew better. I felt like I needed to quit once and for all. I found your book, and it completely changed my game in so many ways. Most importantly, mentally. I’ve read all the books on strategy, and “how to win”, and the like, but never have I read anything so revolutionizing as your book. Thanks for being my “Grand Master” of poker, and helping me turn my game around. Eventually I quit all that stuff. I quit running out of money, and I quit being the last guy to quit. Nowadays, I think of quitting as a skill set unto itself, with branching subsets of skills for each type of quitting situation. There’s knowing how to quit at limit games, and there’s knowing how to quit at no-limit. There’s knowing how to quit when you have a curfew, and when you don’t. There’s being able to quit when you’re ahead, and when you’re stuck. There’s quitting when you feel good, and for when that doesn’t happen, you need to know how to quit when you feel bad. There are many ways to outquit your opponents. From the instant each of us learned that three-of-a-kind beats two pair, we have been working on our A-game. When we think about how we play, we are working on our A-game. When we read a poker book, we are working on our A-game. When we write about hands or talk about hands, we are working on our A-game.
. . . Whenever you lop off some C-game, you increase the percentage of time you spend playing your A-game. This means that the work you put into your A-game will pay a higher return by being put into play more often. There have been times when I wondered how I could ever lose. Days, weeks, even months sometimes, when all I did was win, win, win. Even when I lost I won, because I’d hardly lose anything, and I knew I had kept damage to the minimum possible. When I lost while I was winning, I didn’t lose pride, momentum, or courage. There have been times when I wondered how I had ever won. Days, weeks, even months sometimes, when all I did was lose, lose, lose. I’ve had runs of bad luck that were so long and so brutal that I was absolutely convinced that no one else on earth had ever been so unlucky. But realistically I knew that could not be so, or even if it was, I could not know it to be so. Noise, so much noise used to bounce around in my head, all the time. All of my good streaks and all of my bad streaks of every length and depth have had one thing in common. They did not exist in your mind. They only existed in my mind. And this is true for everyone’s winning and losing streaks. None of them actually exist. They are all mental fabrication, like past and future. Everything that ever happens happens in the present tense. But how can you have a “streak” in the present tense? You can’t. And therefore, if you are in the present tense, which, in fact, at this time, you are, then at this moment there is no streak in your life. There is no inherent existence to streaks. The streak is there when you think about it, and when you stop thinking about it, it goes away. It blossoms and withers, all in your mind. And when your mind invents a streak, you believe it exists, because you believe what your mind tells you. But the truth is there is only the hand you are playing. Sixth street starts when the betting stops. Sixth street is when players relax, which is why it pays not to. Sixth street can start at the end of any street. For example, Joe raises before the flop and only Moe calls. On the flop, Joe bets, Moe raises, and Joe folds. The pot is awarded to Moe, and sixth street begins. Any reaction to the hand constitutes sixth street action. If a hand ends with no comments, no gestures, and no strained silence, then that hand did not have a sixth street, in the same way that some hands don’t have a river. For any given hand, sixth street is over when no one is talking about it. Sixth street is usually finished by the time the next hand starts, although for some hands it can last for years. We’d want our game to unleash waves of agony and anger, again and again, on every player. We would call our game a success if it caused depression, oppression, beguilement, defilement. Bad Times would follow us around and cause us grief, by souring our relationships, our disposition, and our grapes. We would design and refine our game to be seductive, and addictive, in multiple ways, so that its snares snag many, many times. Our game would not be like chess. At chess, whoever plays the best wins. Where’s the agony in that? Our game must be viciously unjust: the better you play, the more exquisite will be your torture. To that end, we will employ a significant randomizing agent. Something like randomly selected pieces of paper with markings on them would work. We would attenuate the luck factor so that it causes the maximum amount of confusion, and delusion, and bad times, and very bad times. Our game would not be like football or any other game that has teams. A team forms a supportive network that makes losing easier. We’ll have none of that in our game. Not only will nobody and I mean nobody share your pain, they will probably enjoy it. Mountain climbing is painful, but Bad Times would not be anything like mountain climbing. A mountain climber is so busy at not freezing to death and not falling to death that his pain doesn’t really get a chance to cook properly. Our game would have gaps in the action, plenty of time for steaming, and simmering, and stewing, and boiling, plenty of time to allow the thinking mind to wander off and injure itself, so that we can practice healing it. Let’s see. What else. Oh, I know. Proximity. We’ll sit in a circle, as close as we can get without touching. That way the bad vibes of Bad Times can spread easily and quickly, spraying fertile spores of conflict. And let’s have comfortable chairs that stick to people who are stuck. And we’ll have dealers, ghastly beasts possessing wizardly powers, able to raise the frequency and pungency of the bad times. What would be at stake? What could we put on the line that would pour on the pain? What could we lose that would amplify the anguish? Pride? Of course there would be that, but loss of pride is not nearly severe enough to do the damage we’re after here. Plus, everyone doesn’t have it, so everyone can’t lose it. We need something that is universally valuable. Something everyone has, and wants more of. We decide that in our new game, the loser will pay, not only in pride, but also in cash. Money buys time, and food, and choices. Money is time, and food, and choices. Money equals food. Food equals life. Money equals life. Broke equals death. In our society, wagering money is as close as we can get to betting our lives. With so much at stake, our game is sure to cause desperation, and treachery, and man, this is truly a nasty game we are inventing here. Do you think we’ll be able to get anybody to play it? We play our new game, and the bad times come, and we remember to follow our breathing. In, and out. In, and out. By doing so, we set aside our thoughts about what went wrong, and we step away from our thoughts about what might go wrong, and for that moment, when those thoughts are gone, so too is unhappiness. By eliminating the past, and eliminating the future, we give ourselves this present. We will practice this process of elimination, using our new game, and it will become for us a process of illumination. Let us play.